Despite injuries this season to a pair of expected major contributors, Seward finishes the regular season 25-5 and 10-4 in the Jayhawk West. Without injured Tamara Seda and Brooklyn Artis the Lady Saints capped off their season with a second place finish in the Jayhawk West. 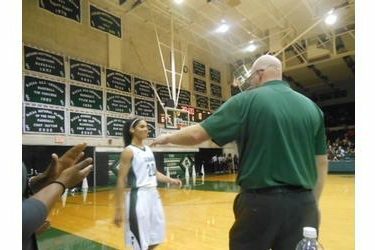 Seward beat Pratt for the 47th consecutive time 72-54 Wednesday night in the Green House on Sophomore Recognition night. The #20 Lady Saints shot 51 percent form the field and maded 7 of 16 three pointers. Fabiana Monte scored 17 while Rebekah Hatchard added 16 and Shanise Brooks scored 15. Payton Fleming scored 10. Seward held Pratt to 34 percent shooting and 26 percent in the second half. Pratt was going for their first winning conference season in 25 years but finishes 7-7 in the Jayhawk West and 20-10 overall. It’s now time for the Region 6 Tournament. Seward hosts 11-19 Neosho County Saturday night at 6 on B107.5 and kscbnews.net. For tickets, visit Sewardsaints.com for ticket venues.